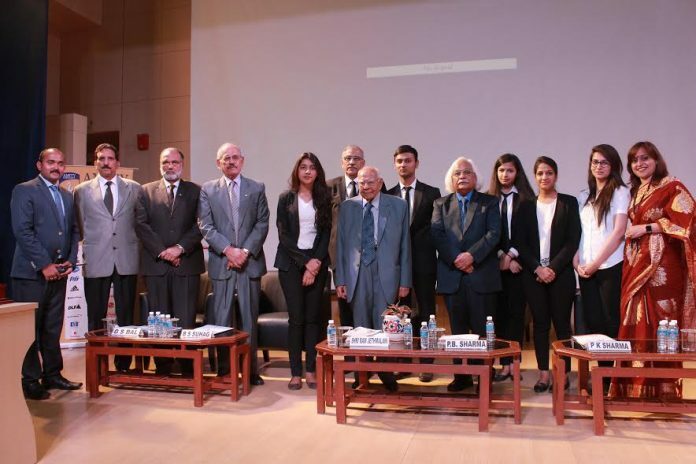 New Delhi: The 2nd National Moot Court Competition (24th March to 26th March) organized by Amity Law School, was inaugurated today at Amity university Gurgaon (AUH) campus by Shri Ram Jethmalani, Hon’ble Member of Parliament (Rajya Sabha) and Prof. (Dr.) P B Sharma, Vice Chancellor, Amity University Gurgaon. The moot court has chosen the theme of “Intricate Constitutional Issues including Uniform Civil Code and Surrogacy.” The event will seek to integrate the academic potential, legal insight and art of advocacy amongst the law students of 40 Teams, each comprising of 03 students from prestigious Law Schools/Universities of the country wherein their mooting and drafting abilities and argumentative skills would be put to test. These 40 Teams represent the best in the country, some of these being IIT Kharagpur, Eight National Law Universities, Govt Law College Mumbai, ILS Pune, Delhi University, Aligarh Muslim University, Symbiosis Pune, Three Amity Law Schools and Army Institute of Law, Mohali. The prizes amounting three lakhs will be distributed to the winners adjudged First, Second and Third positions in the competition. Welcome address at the inaugural function was delivered by Prof (Dr.) P B Sharma, Vice Chancellor, Amity University Gurgaon. While addressing the distinguished gathering Prof Dr PB Sharma said that “Our legal education is required to create lawyers who would practice this privilege with utmost sincerity and commitment to the cause of “Satyamev Jayate Na-anrtam”, i.e the truth always prevails and not the untruth. A law abiding society is our cherished dream and let it not remain our wishful thinking, else we shall loose the opportunity to build India of our dreams. “Privilege of a lawyer is a “privilege to serve and privilege to excel”. Our legal education is required to create the lawyers who would practice this privilege with utmost sincerity and commitment. A law abiding society is our cherished dream and let it not remain our wishful thinking, else we shall loose the opportunity to build India of our dreams.” Prof Dr P B Sharma added. While addressing the gathering Shri Ram Jethmalani, Hon’ble Member of Parliament (Rajya Sabha) said “A lawyer should have five virtues i.e. Honor, Integrity, Fight for Justice, Hard Work, Fearless”. Shri Ramjethmalani will complete 75 years of practice tomorrow as a lawyer said “Tomorrow I will complete 75 years as a lawyer. And trust me students most of work (90 percent) I do, I do it for free. So always remember that fight for justice and not for money. Courage and Character are two essential tools to achieve your goals.” Ram jethmalani added. The Final round of the Moot Court Competition will be held on 26th March, 2017. The winners will get certificates, trophies and cash prizes. The inaugural ceremony was concluded with a vote of thanks by Maj Gen P K Sharma (Retd.). Maj Gen BS Suhag(Retd. ), Deputy Vice-Chancellor, AUH, Maj Gen G S Bal, Dean of Student Welfare, Sq Ld S K Singh (Retd. ), Pranshul Pathak, Dr. Vikas Madhukar were present at the function with HOI’s, faculty members and law students were present in large number.